I sink to the corner of my bed and stare into the room as if I've never seen it. Everything is changing. My relationships are changing, my future is changing, my feelings are changing. My life is one big constant state of flux. I grew up scared of spiders, bees, and dark corners in dimly lit basements. But this foe . . . change . . . it terrorizes me like nothing before. In a handful of hours, I'm going to head home, and the one lesson I learned from Josh's death is that life has to be lived now; the future isn't always guaranteed. I have this one shot with her, and I'm going to take it. Even in a story of less than 100 pages, Katie still knows how to hit you in the feels. The story behind Lila and Lincoln is simply adorable. We might not interact with them on the same grand scale that we did with Katie's other characters, but it certainly doesn't feel that way. The story begins with letters between Lila and Lincoln who met at the funeral for Arie's, Echo's brother, before the events of Pushing the Limits. Over the course of the next two years, they would write letters to one another and quickly became, for lack of better words, long distance best friends. Very old school and very sweet. When Lila uncovers a lie Lincoln had told her, he takes it upon himself to drive the 12 hours to her house so he may explain face to face. How many people out there would drive even half that to fix their mistake? The next day or so that they spend together is such a sweet romance, an adventure of two friends finally connecting after getting to know one another only through letters. One of my favorite aspects that Katie did with Crossing the Line is that before each chapter, she would insert snippets from their letters to one another. These snippets built a foundation of their relationship that we would have missed otherwise and helped us to connect with these characters. 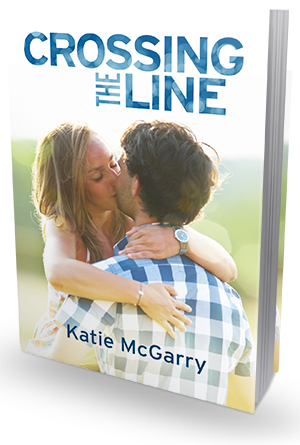 It's not often I can read a 67-page novel and feel for these characters like I do, but Katie just has this natural raw talent for creating amazing chemistry between two characters - even two that have only communicated through letters for the past two years. I want more of Lincoln and Lila, but at the same time, the amount of time we spent with them felt right. I don't know if we'll see more of them in Breaking the Rules, but I'd settle for a snippet of "They're still amazingly in love and doing fabulous."